Our behind-the-scenes program offers your small group exclusive access to exhibit areas rarely seen by the general public. All tours and experiences are led by passionate Zoo staffers and our stellar keepers. Create special memories while learning more about your Zoo, animal behavior, enrichment and conservation! Packages include parking and Zoo admission for everyone in your group on the day of your tour or experience. Gift certificates are also available for holiday giving. 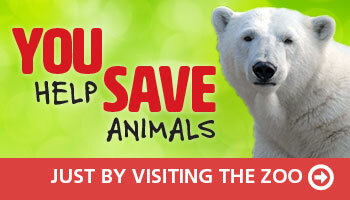 includes up-close viewing of polar and grizzly bears, sea lions, and harbor seal. includes up-close viewing of orangutans, siamangs, babarusa pigs, Malayan tapirs, and a Sumatran tiger. Please note, Little Penguins are not included on this tour. Recommended for guests ages 5 and up. Behind-the-Scenes Tours and Experiences can be booked any day of the week year-round (subject to availability) except on major holidays, and are usually scheduled 3 – 4 weeks in advance. Please note, Tours and Experiences are rain or shine events. Contact Leslie Wilson at Leslie.Wilson@louisvilleky.gov for additional information or to book your experience today! We are currently booking behind-the-scenes tours and experiences for dates through the end of May. Please note, no tours or experiences will be offered on federal holidays or over Derby weekend (5/3/19 – 5/5/19).